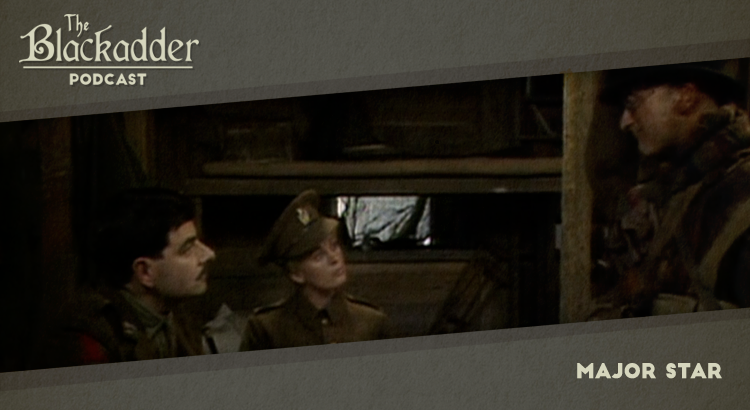 Major Star was the third episode of Blackadder Goes Forth and features a cabaret extravaganza and a surprising proposal of marriage. In this podcast Gerry and Iain consider the ethics of using live moustache substitutes. Alongside the series regulars this episode featured a welcome guest appearance from Gabrielle Glaister, who of course portrayed Kate/Bob in the Blackadder II episode Bells (which we covered in Episode 1 of the podcast). Major Star was released in 1989. It is 30 minutes long and originally aired on the BBC. Blackadder Goes Forth is presently available on Netflix and a remastered set of the whole series is available on DVD around the world (Region 1) (Region 2).